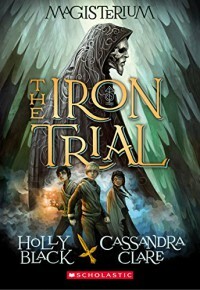 THE IRON TRIAL is the first book in a new series – Magisterium – by Holly Black and Cassandra Clare. Callum Hunt has been warned, by his dad, about the dangers of magic his whole life. So when he’s forced to take part in a series of tests that could mean he becomes a student of magic at the Magisterium, Call is determined to fail. Only, Call ends up passing the tests somehow. I had been curious about this book for a while. Being a fan of Holly Black I was curious to see how she would write a magic school book, but I was wary because I am not a fan of Cassandra Clare. I decided to be brave and read the book, and I was pleasantly surprised. It was a fun read. I found it easy to fall into the world of the Magisterium, and I found myself rooting for Call and curious about the world. It would be easy of course to compare THE IRON TRIAL to the magic school series that became – and still is – popular almost two decades ago, Harry Potter, but I think that to do so would sell both short. THE IRON TRIAL is set in the US and later than the Harry Potter series, Call and his friends talk of mobile phones and the internet. Black and Clare, being aware of the Harry Potter series and other, more recent, books in the fantasy genre, explore the tropes of the genre in a way that surprised me and left me hungering for more of the series. I really liked the idea of the hero of the book not wanting to go to magic school; to be quite content, despite all the hardships, to stay in North Carolina with his father. I also thought it was an unusual twist to have the main character of a fantasy have a disability – and I think Black and Clare wrote this well. The obvious diversity in characters was well handled, and I think that they created some interesting characters. The plot of the book was quite subtle, and whilst it did take me a couple of chapters to get into the story I thought it was really well thought out and that there is a lot of promise for future books in the series. If you are a fan of the fantasy genre, then this is definitely a series that would be well worth you checking out. Black and Clare take a different approach from those typically found within the genre, so this might be good for those of you who want to stay within the fantasy genre but want something a little different.